The Tokina 11-16mm f/2.8 AT-X Pro DX Lens review is the first Tokina lens review I've had the pleasure of creating. And it has been a very positive experience. This is a well-built, ultra-wide angle lens that has very good overall image quality and, at review time, has the widest max aperture available in a zoom lens wider than 14mm. The Tokina 11-16mm f/2.8 AT-X Pro DX Lens review is one of a group of ultra-wide angle lens reviews I am creating and directly follows the Sigma 8-16mm f/4.5-5.6 DC HSM Lens Review. Thus, you are going to see many of the same comparisons and information in each of these reviews. Getting the proper focal length or focal length range is a very important criteria when selecting a lens. And the first attraction to any ultra-wide zoom lens is in fact the ultra-wide focal length range, so let's review what this focal length range looks like. Being a Tokina "DX" (Digital Format) lens, the Tokina 11-16mm f/2.8 AT-X Pro DX Lens has a smaller-than-full-frame image circle designed to work only on APS-C/1.6x/1.5x FOVCF DSLRs. All of the ultra-wide angle lenses compared in this review are the same in regards to this smaller image circle. Thus, the focal lengths shown for all of the lenses below are similar to 1.6x longer focal lengths on a full frame SLR or DSLR. The Tokina's 11-16mm frames like a 17.6-25.6mm lens on a full frame DSLR. In terms of focal length ranges, the focal length numbers mostly tell the difference. 8mm is wider than 11mm and 24mm is longer than 16mm. The Tokina 11-16mm f/2.8 AT-X Pro DX Lens has a shorter focal length range than of any of the other lenses in this comparison. It does not go as wide and it goes no longer than any of the others. Still, 11mm is very wide and 16mm is quite useful. The 11-16mm range will complement an 18-something mm lens nicely. Landscape photographers are of course one group that loves to find a close subject and frame it in a striking, vast in-focus scene using the deep depth of field these ultra wide angles of view (with narrow apertures of course) give them. With an as-wide-as-it-gets-in-a-zoom-lens maximum f/2.8 aperture available over the entire range of focal lengths, this lens can stop action in low light better than the rest of the available-at-review-time lenses in this class. The nearest competitor is the 2/3 stop darker Sigma 10-20mm f/3.5 EX DC HSM Lens. Thus, low light action is a use this lens is suited for (though AF may be a limiting factor in shooting very fast-approaching subjects at short distances). It is especially nice to have wide open aperture exposure values remain constant throughout the zoom range of a fixed maximum aperture lens - a feature shared only by the Sigma 10-20mm f/3.5 EX DC HSM Lens in this test group. Here is a table that compares the max aperture for these lenses. Keep in mind that built-in flash coverage on most DSLRs will not cover 16mm, so plan on an alternative method of flash lighting/diffusion if planning to use flash with this lens. Being my first Tokina lens, I was especially anxious to see how it performed optically. The Tokina 11-16mm f/2.8 AT-X Pro DX Lens delivers very good center sharpness wide open and shows slight improvement when stopped down. Corners at f/2.8, especially at the wide end of the focal length range are obviously softer than the center. This is not unusual and the image quality in the corners is not terrible. By f/4, corners are looking better and by f/5.6, they are looking great. I have been especially pleased with the real world image sharpness this lens delivers - especially for landscape photography at f/8 or so. For a lens this wide, the Tokina 11-16 has remarkably little distortion on not-too-close subjects (perhaps part of the benefit of a short focal length range). I can detect a small amount of barrel distortion at 11mm. The barrel distortion transitions to nearly no distortion at 14-16mm. At 11mm, the tokina 11-16 has nearly 2 stop of vignetting in the extreme corners at f/2.8. Vignetting diminishes as the focal lengths get longer and the aperture narrows, but still expect about .8 through .6 stops of shading in the corners at f/8. Though not bad, you will see slight shading in the corner of your frames with an even-colored background (such as a blue sky) at f/8. This lens performs best (or near best) in class in this regard. A normal thickness UV filter will add a small amount of vignetting at 11mm and a normal thickness circular polarizer filter will of course add even more vignetting. 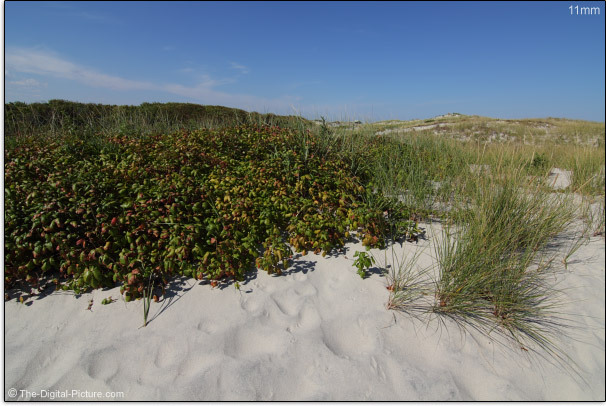 These differences can be reviewed in the Vignetting Tool using the mouseover feature. With focal lengths this wide, you can expect bright light sources to often be included in the frame. And if you are shooting outside, the sun is likely going to be the biggest one. The Tokina 11-16 arguably trails this lens class by showing the most flare in this specific situation. Unless you like the effect (my daughter thinks it's cool), you are going to have a challenge removing the Tokina 11-16's flare from your images in post processing. The best option with this lens is to avoid the flare in the first place. Tokina 11-16 images readily show CA (Chromatic Aberration) in the corners at all focal lengths. The appearance of the CA remains similar throughout the focal length range. The Tokina 11-16 has a 9-blade rounded aperture, but the quality of that blur (bokeh), if even noticeable, is not especially great, showing a bright outline to OOF specular highlights. While the 11-16 can indeed create some background blur, this is probably not the reason you want to buy this lens (or any ultra wide angle lens). The Tokina 11-16mm f/2.8 AT-X Pro DX Lens is not the fastest autofocusing lens - nor is it the quietest. The 11-16's micro-motor AF drive focuses reasonably fast, but most of the time (perhaps 90% of the time), the 11-16 will make a second focus adjustment immediately after the first. 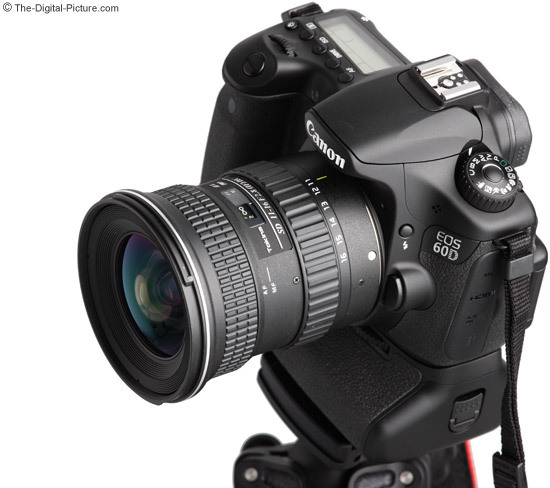 This is as tested on the newest Canon APS-C DSLR available at review time, the Canon EOS 60D. While not terribly slow, the second focus adjustment definitely increases the overall focus acquisition time. Ultra wide angle lenses can get away with slow AF much easier than longer focal length lens can. The AF sound is not loud, but it is audible - a tsss-tsss sound typically is heard - one tsss for each focus adjustment. Having a wider max aperture than most lenses at these focal lengths (shallower DOF) gives the Tokina 11-16 need to focus more precisely than the rest, but the AF system is still not challenged too strongly with most uses this lens will see. Overall, I've had good AF accuracy from this lens, but did find it to slightly misfocus occasionally. FTM (Full Time Manual) focusing is not available in the Tokina 11-16mm f/2.8 AT-X Pro DX Lens, but the focus ring does not turn while autofocusing. A shift forward or backward of the focus ring is used to disengage (AF) or engage (MF) the manual focus gears. Tokina refers to this as the One Touch Focus Clutch Mechanism. This is not my personal favorite system, but it works fine - and it is perhaps better than the typical micro-motor AF lens system that utilizes a switch and always-engaged MF gears (focus rings turns during AF). The manual focus ring is very smooth with no play and it has a relatively wide range of adjustment (for an ultra-wide angle lens). Video shooters will also appreciate the lack of focus breathing - the subject framing does not change with focus adjustment. The Tokina 11-16 turns in what is easily the lowest MM (Maximum Magnification) value in its class. Actually, the Zeiss 18mm f/3.5 Distagon T* ZE Lens is the only lens in my current-at-review-time lens specifications database with a lower MM value (0.08x). And the Canon EF 1200mm f/5.6 L USM Lens, on the other end of the focal length spectrum, is the only other lens with the equivalent MM spec. If the in-your-face, perspective-distorted close-up look is what you really want, the other lenses in this review group, with their shorter minimum focus distances and wider focal lengths, are going to better-create it. I suppose another way to look at this spec is that it will prevent you from making the most-severe perspective distortion mistakes. The rear-positioned (where I like it) zoom ring is smooth with no play or wobble and a nice amount of rotation. Zoom ring rotation is in the opposite direction of Canon lenses (the same as Nikon lenses). The Tokina 11-16 does not change size with focusing or zooming (and the filter threads do not rotate). The zoom and focus rings are raised from the lens barrel and have different, but significant ribs in their rubber grips. The push-pull auto-manual (respectively) focus ring can be seen changing positions in the examples above. The Tokina barrel finish is nice. The flocked-interior (like Canon lenses) Tokina BH-77A lens hood is included in the box with this lens. It smoothly and easily bayonet mounts (push and twist), snapping into place. Two notables from the image above: The space between the Canon 10-22 and the lenses beside it increases significantly because of its ultra-wide lens hood, and the size order of these lenses practically reverses with the lenses extended and the lens hoods in place. Again, the physical size differences between these lenses is not significant - and all of these lenses are a very nice-to-use size. Here is a chart with the specific lens specifications. 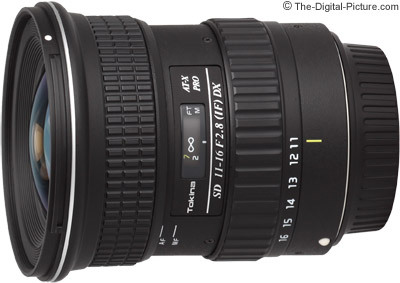 The Tokina 11-16mm f/2.8 AT-X Pro DX Lens is the heaviest lens in this review group. But tipping the scales at 19.8 oz (560g) does not make it a heavyweight lens. Even though the lens barrel construction is plastic, this lens feels solid - partially due to the large amount of glass in it along with the primarily-rubber grip surfaces. I can carry this lens for long periods of time without any strain. The 11-16's 77mm filter size is a common one. These filters are not small or inexpensive, but they can often be shared among other lenses from various manufacturers. Be aware that a circular polarizer filter is going to provide very uneven results when used at 11mm on this lens. None of these lenses are weather sealed - don't be confused when you see "WR" (Water Repellent) listed as a spec for the Tokina 11-16. A "coating made of a special compound has been applied to the front surface of the lens through the use of a unique evaporation process. As a result, the lens offers excellent water- and oil-repellent performance and makes for easier cleaning should the lens be accidentally smeared with fingerprints or cosmetics." So, WR refers to "water-resistant protection to the front element only" [B&H]. This is of course a good feature to have. Sorry - I didn't try smearing my front element to test this feature. Just couldn't bring myself to doing it. For many more comparisons, review the complete Tokina 11-16mm f/2.8 AT-X Pro DX Lens Specifications using the site's Lens Spec tool. Note that the Sigma 10-20mm f/3.5 EX DC HSM Lens performs much worse on the left side of the frame (as shown in the comparison) than on the right. You will see the difference when comparing this lens in the ISO 12233 chart sample crops. 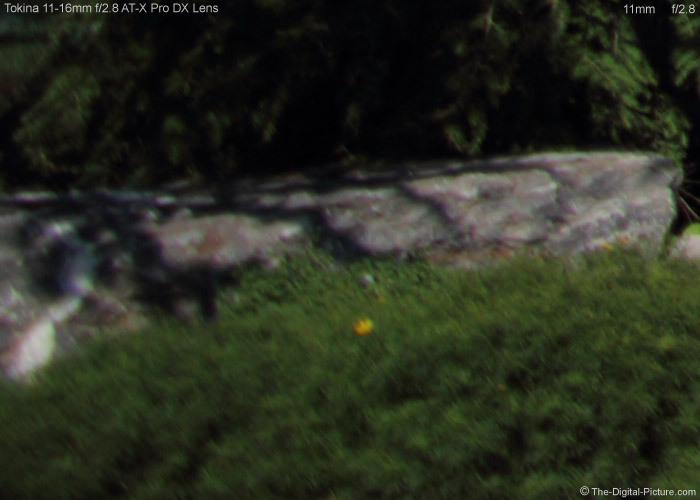 Click on the image below (opens in a new window) to see a comparison between similar lenses. In the corner image quality comparison, the Tokina 11-16mm f/2.8 AT-X Pro DX Lens holds up well at 11mm when compared to the other lenses at equivalent apertures. And at 16mm, it rules the competition. I've already mentioned the Tokina's focal length range disadvantage and significant max aperture advantage over all of these other lenses. The aperture advantage makes the 11-16 the definite choice for stopping action or handholding in low light - if the shallower but still reasonable DOF is acceptable for your needs. The Tokina shows far more flare than the other lenses, with the Canon coming closer at 16mm. This is a disadvantage whenever bright lights are in or near your frame. The Sigma 8-16mm f/4.5-5.6 DC HSM Lens and Sigma 10-20mm f/4-5.6 EX DC HSM Lens have less CA. CA is one of the easier lens aberrations to correct in post processing. The Tokina has less vignetting than most of the rest. The Canon has Ring USM AF and the Sigma lenses have HSM to their advantage. The Tokina 11-16 is a lens of bests and worsts, but its price tag falls in the middle of those of this group - and noticeably lower than the most expensive lens (the Canon). For the money, the Tokina 11-16 is a very strong performer optically - a very good deal. At review time, the Tokina 11-16 is available in Canon (reviewed), Nikon and Sony/Minolta mounts. My standard disclaimer: There are some potential issues with third party lenses. Since Tokina reverse engineers (vs. licenses) manufacturer AF routines, there is always the possibility that a DSLR body might not support a (likely older) third party lens. There is also the risk of a problem that results in the lens and body manufacturers directing blame at each other. Tokina USA's 3-year warranty is 3x longer than Canon's 1 year warranty. 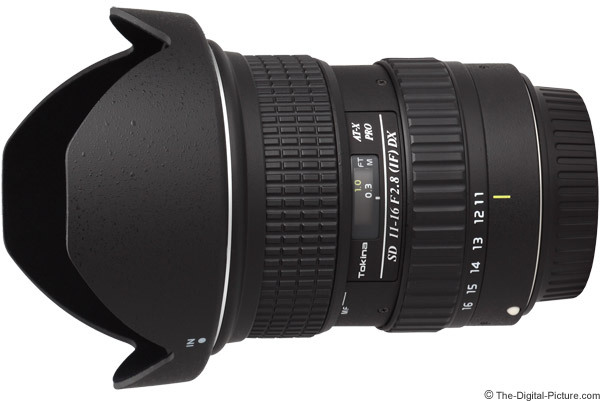 The Tokina 11-16 is a very popular lens and for good reasons. I know that I said the same thing in the Sigma 8-16mm f/4.5-5.6 DC HSM Lens Review, but, I think the Tokina 11-16mm f/2.8 AT-X Pro DX Lens is also a great addition to the kit.